Coming up unique and interesting Valentine’s gifts doesn’t have to be difficult. Love watches make great gift ideas for women or men. A simple I love you, or hearts and flowers on a wrist watch face can be an ideal way to share Valentine’s Day with your loved one. These are some of my favorite designs for love watches for women. Both great looks and great function. Customize your choice to say even more if you want. Your lady will appreciate your choice and be able to wear it with so many outfits. Finding the perfect Valentine’s Day gift for the man in your life is easier when you choose one of these great designed love watches. Lots of choices just for him. The design can be customized just for your man and you have several choices for the band style. All are water resistant to 30 meters, but many can easily go deeper if you want. Every one of these featured designs is available on your choice of band style. Stainless steel hinged versions, colors of many varieties and even glitter bands just for the glitz time. But there’s even more. Vintage leather strap, 2-tone metalic, and sporty are part of the choices. While these watches are adjustable for nearly every adult sized wrist, there are also choices just for children’s wrists. Some watches feature large face, while others are small-faced. Your choice of so many different options and colors. If you want to be a bit creative, you can easily customize your own design at Zazzle.com. It’s simple to upload an image, add your text and arrange the whole thing all you like. Many of the featured designs let you add more with special text, like your Valentine’s name. You can easily end up with the most unique and unusual gift idea ever this year. 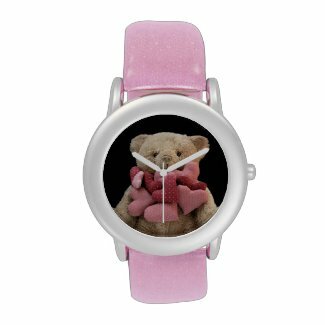 With a love watch just for Valentine’s Day gifts, you will be a hit. What a wonderful option. As you know, my husband loves watches. This would be right up his alley! Thanks for the suggestion. Now I know what to get him for Valentines’ Day! These are beautiful watches! I especially love the teddy bear!